Kirkcaldy moved painlessly into the third round of the National League Cup when then their opponents in Round 2, Lasswade, called off their tie at Beveridge Park last Saturday citing lack of front row players because of injury. The national cup competitions have lost a lot of the attraction they had 20 years ago or so with teams calling off much more than they used to, perhaps due to the absence of prize money, or in some cases to avoid a likely heavy defeat. In the senior National Cup and in the National League Cup there were four ties forfeited. The blank Saturday allowed those on the Blues’ worryingly long injury list a further week’s recovery time before the side travel to Kelso for what will be a tough encounter at Poynder Park (kick-off 3.00 p.m). Although the Blues had a comfortable 41-14 win when the teams met in early September the Tweedsiders are now considerably stronger with the return of several players who had gone to St Boswells and are nbow in eighth place in the National 1 table, one place and five points ahead of the Blues who however have a game in hand, the postponed away fixture against Hamilton. In Kelso’s last game two weeks ago they came off a poor second best at Musselburgh with a 67-24 loss, a margin of defeat slightly greater than the one suffered by Kirkcaldy at the same venue seven days earlier. Two notable absentees from the Kirkcaldy line-up at Poynder Park will be flanker Dayle Turner and scrum half Scott Anderson but likely to be fielded are Alex Black and Marcus Salt who both missed the recent Selkirk game. Kirkcaldy 2nd XV had an excellent win at Carnoustie least Saturday to moved them up the league table. 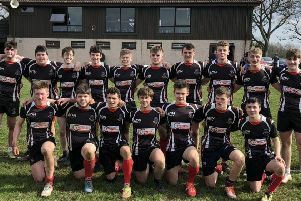 This week they have another chance to progress when they entertain Falkirk 2nd XV (kick-off 2.00 p.m).